Are Pluto's Pebbled 'Snakeskin' Slopes Made of Ancient Stuff? Pluto's intriguing "snakeskin" terrain, which New Horizons mission team members have informally named Tartarus Dorsa. Pluto's mysterious "snakeskin" terrain may be made of stuff that predates the solar system's birth, scientists say. NASA's New Horizons spacecraft spotted the strange landscape — which appears pebbly and scaly from a distance — on the eastern side of Pluto's famous "heart" during the probe's epic flyby of the dwarf planet last July. Computer models created by the New Horizons team suggest that the "scales" are actually tightly packed minimountains about 1,650 feet (500 meters) tall. New Horizons' measurements showed that the snakeskin region — which the team has informally named Tartarus Dorsa — is dominated by methane, with some water thrown in for good measure. So the scaly peaks could be composed of pure methane ice, or, perhaps, of methane clathrate ice — methane molecules surrounded by a "cage" of water molecules, Umurhan said. 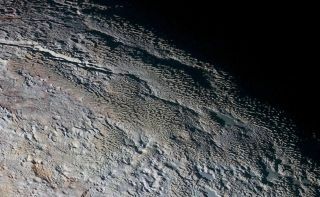 It's unclear if pure methane ice is strong enough to maintain such steep slopes over long periods of time under Pluto conditions, Umurhan wrote. There are only two known studies that address this issue, and their findings are ambiguous; one found that pure methane would be too mushy, while the other suggested it could be stout enough, if the individual methane crystals were big enough. And what if the snakeskin slopes are instead made of methane clathrates (which are found on Earth — for example, in the very deep ocean)? Well, that would be exciting, according to Umurhan. Recent studies "strongly suggest that methane clathrates in the icy moons of the outer solar system and also in the Kuiper Belt were formed way back before the solar system formed — i.e., within the protosolar nebula — potentially making them probably some of the oldest materials in our solar system," Umurhan wrote in his blog post. "Might the material comprising the bladed terrain of Tartarus Dorsa be a record of a time before the solar system ever was? That would be something!" he added.